is danger and a venomed sting. seeking a path to sky and sun. 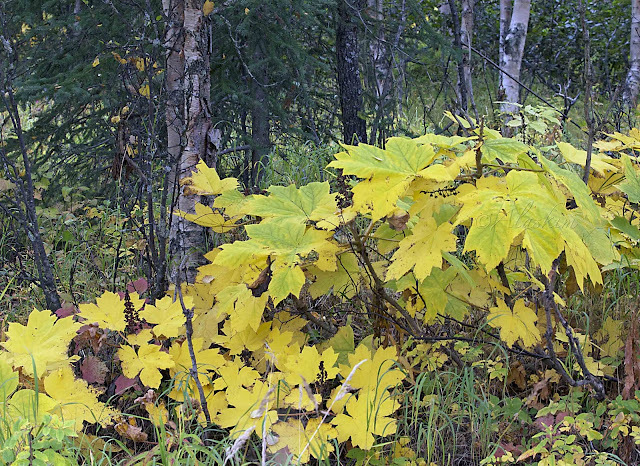 Russ and I have just returned from Isle Royale where Devil's Club also grows. It is kind of pretty, but I have to agree with our Iowa writer, Hamlin Garland. I hate the stuff. Yeah, I agree with Barbara, the leaves don't look all that bad from a distance but if you get close and take a look at the plant under the leaves it's a whole different story. Ouch. Never heard of Devil's Club. You can keep it. We have enough ouch plants. So is this like me appreciating all the cactus around me? It doesn't look that bad to me from the picture, but I know so little about plants I can hardly comment! I love that color, but I bet it's a beat to get rid of!